GUARD OF HONOUR: Local Cllrs and TD's formed a guard of honour as the removal of Cllr Margaret Gormley to Cloonameehan Cemetery. THE funeral of Independent Cllr Margaret Gormley, who passed away on Friday last, was held in Bunninadden today, Monday. 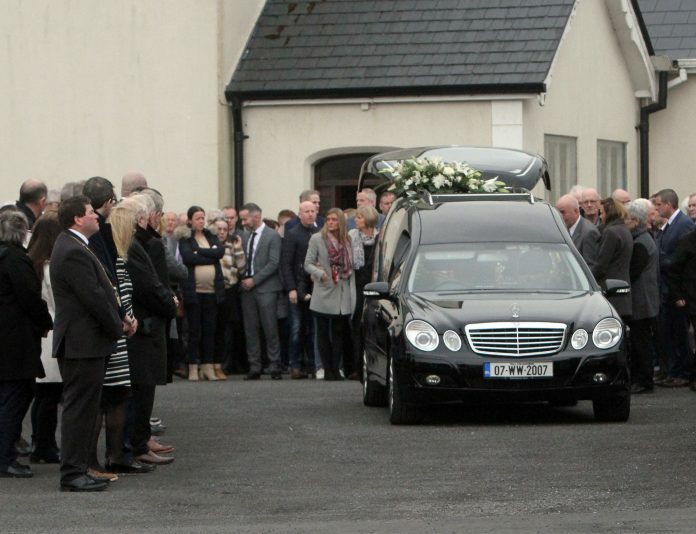 Cllr Gormley’s funeral was attended by hundreds of mourners, from the local community and throughout the county, as well as her colleagues on Sligo County Council and other public representatives. A guard of honour was also formed by elected politicians. The funeral mass was held in the Church of the Sacred Heart with burial afterwards in Cloonameehan cemetery. In a political career which spanned four decades, Cllr Gormley was first co-opted to Sligo County Council in 1980 following the death of her father Willie. In 2004, a highlight for her career was when she was made Cathaoirleach of the council. Since 1985, she has been re-elected in each local election and regularly topped the poll. Tributes poured in for Cllr Gormley with Cathaoirleach Martin Baker describing her as “a great champion for the underdog”.